Children certainly are a precious gift, and we celebrate that gift today in the Sacrament of Baptism. Thank you, parents and God-parents, for being here, for supporting your child, to help them to say yes, and, as they grow in years, to learn about our Lord and Savior and to develop their love for him. Children don't just find faith, they are brought up in it, they are raised in it. Children are a most precious gift indeed. 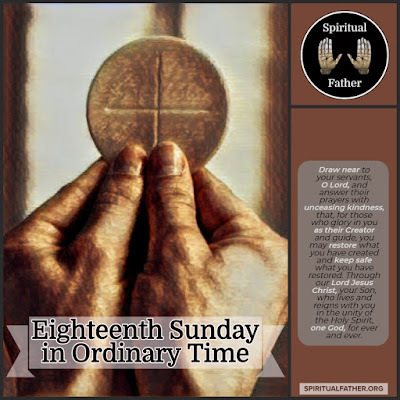 I should be able to continue our discussion of the bread of life discourse - John chapter 6, the great chapter which Catholics go to time and again to look for reassurance of the true presence in the Eucharist. Of God’s body, blood, soul and Divinity bestowed upon us under the form of simple bread and wine. We see this laid out there in John 6, the entire chapter is made up of scene after scene, line after line, reassurance of what we do here at this altar is truly what Christ asked us, and indeed commanded us, to do in remembrance of him. We have faith in that, in fact, John, in his Gospel, doesn't even have a last supper scene. He puts all his Eucharistic Theology there much earlier, in the sixth chapter of his Gospel. The other Gospels wait a little while John has the Eucharist front and center. He wanted to make sure that we understand what Christ has come to do. I would love to go on about this most precious gift of the Church. As I said we have two, and the first is only slightly more important than the second. If the first most precious gift is the Eucharist, the second most precious gift are our children. The children we are given to form as we support families, and their vocation to raise Christian children. We – the Catholic Church - educates thousands, if not millions of children throughout the world. We are entrusted with that great gift. I take it for certain that Christ meant what he said in Matthew’s Gospel: “whoever causes one of these little ones who believe in Me to stumble, it would be better for him to have a heavy millstone hung around his neck, and to be drowned in the depth of the sea.” ~ Matthew 18:6 To have a millstone wrapped around his neck and drowned in the sea. Sounds straightforward. It was mentioned after the last Mass: “Father, you can talk about God's wrath a little bit more.” Well, I think Matthew makes it pretty clear to not cause the little ones to sin, and yet here we are again. Why are we here again? For those who haven't seen or heard a grand jury in Pennsylvania has come out with a horrific number of accusations, all of them having been committed some time ago, but still - quite upsetting, quite unnerving really. We live in the shadow of these events, and unfortunately men in power did not have the courage, twenty years ago or more, to hold accountable those responsible for these crimes. For whatever reason year followed silent year, and here we go again. We all, each of us in our own way, has lived, for quite some time, in the shadow of the reality that there are quite literally wolves in sheep’s clothing . 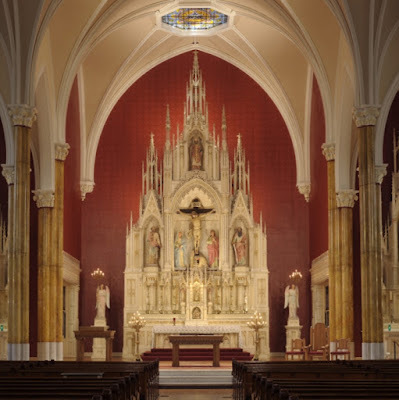 I’m right there in that, having grown up in St. Aloysius parish, just missing one of the most prolific offenders from the Archdiocese of Louisville by a few short years. Just barely missing his possible influence on my life and yet he still effected my childhood – the culture that he left behind reeked, without my knowing it, of his lasting influence. I just want to say for anyone here who has suffered abuse, that is: sexual, physical, emotional, or even spiritual abuse I want you to talk to someone, talk to one of us, talk to a trusted friend, don’t hold it in if you can help it. In these times, when all these reports begin to come out, it could be very difficult for all of us, even more difficult for those who have suffered personally. We must, both personally and collectively, figure out what we are to do in response to this horrific news. 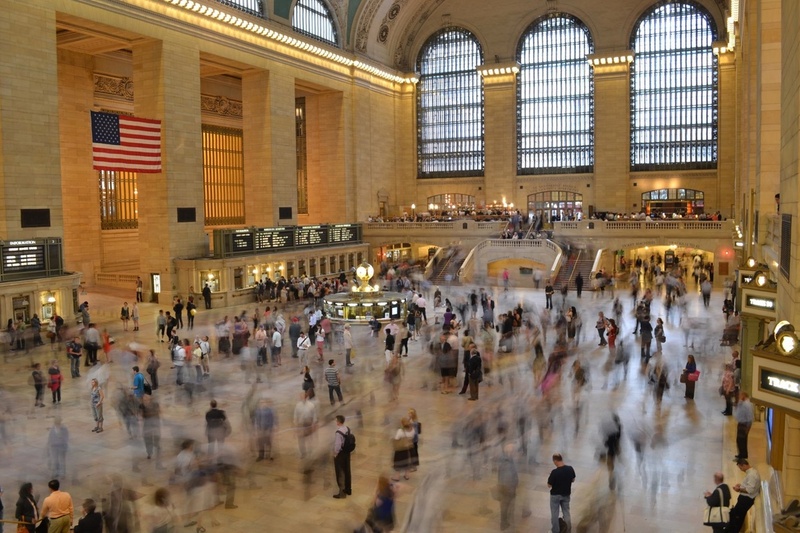 In our culture there is this intense need for us as individuals to solve the problem, for us to do something personally to make the situation better, but really, truly what can we do? What can we do? It has been offered to me, as a suggestion, by a former seminarian who I studied with, not from the Archdiocese but of a different diocese, and no longer associated with the church, that he stated: “Father, you have power, you should refuse to say Mass until something happened, until some legitimate change takes place.” I don't know if I want to deprive you, my sisters and brothers, of the one most precious gift the Church has to offer, in such troubled times because of the failings of others. I don't think that's necessarily the way. Another suggestion has been made that we have Mass, but that the lay faithful come forward and not receive the Eucharist but instead to weep tears of mourning, to weep tears of anger. I don't know, that's for you to decide. These two suggestions aside, each of us is confronted with this need to do something. We must do something. I want to reassure you, even though words hardly instill confidence in times such as these, knowing that actions speak louder than words and hoping you see in my actions the reality of this statement: my sisters and brothers, I swear to you, I swear, if I thought that this was continuing to happen, if I thought there was even the possibility that this is continuing to happen, I would not be standing here. The priests of the Archdiocese are not perfect, I'm not perfect, I think I've made that clear as I have opened myself up to you. We're not perfect, we've made mistakes, and I'm sure some of you are thinking of some examples, but we have dealt with it. We have dealt with those crimes, those difficulties, those situations. 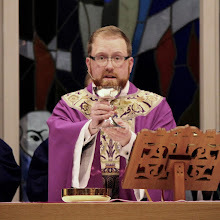 My generation of brother priests have been trained, from the moment we entered seminary ten years ago, “Gentlemen this cannot happen again.” From the very core of our training we have been trained, have been brought up to protect the Eucharist and to honor our children. Deacon Greg here would die for those that he was sworn to protect, that was his training. I would rather die than to see the Eucharist mishandled, misused, and the same for our little ones. I would rather die, so I swear to you. Unfortunately, there will be instances, but we will deal with it, and there are many safeguards in place. At least in this diocese, as far as I'm concerned, we are not going to see a culture that allows this to happen like this again. That’s what I have decided to do. To speak that truth. But what are we to do? What are we to do as we move forward? I’ll offer a suggestion. 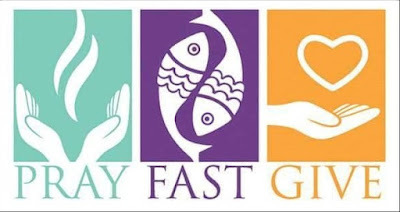 The Church has a long-standing tradition for what we are to do in times of trouble, in times of crisis, in times of anger and frustration and that plan really is simple: we fast, we pray, and we give alms. Fast, pray, and give alms. You may be sitting there thinking ‘Father, what did I do?’ Nothing. In this instance you’ve done nothing. You are still a sinner, a sinner such as I. In this instance you haven't done anything, you're not part of this; but the suffering and the sacrifice of the righteous, for the salvation of the Church, goes much farther than the suffering and sacrifices of the guilty. 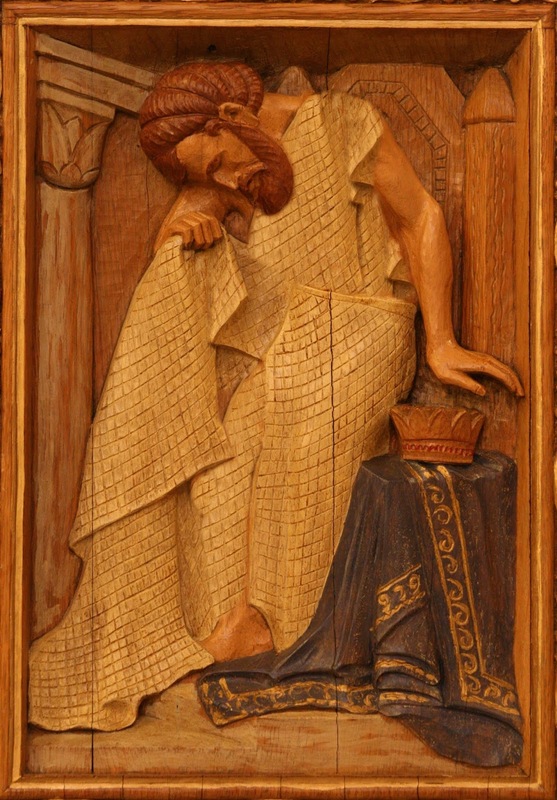 If we look to the prophet Jonah, as he's making his way to through the city of Nineveh, proclaiming the destruction of that city, he preaches to the people saying ‘repent!’ The King puts on sackcloth and ashes, he calls the rest of the people, the men, the women, and the children to repent, to fast, and to wear ashes as well. They didn't do anything. The king should take the brunt of it, but the people fasted as well, and the city was saved. You know who else fasted? The sheep, the oxen, and all the cattle as well; they certainly had nothing to do with the sins of their leaders, but they fasted they had their part. My sisters and brothers, the Church is in danger. The Church is being misrepresented because of these sins and the sins of those on the inside who have not done what they promised, what they swore to do. There is danger ahead. I personally haven't experienced much in the way of outright hatred of the clergy, but there was one instance, while I was in seminary visiting at a friend's house and an acquaintance came over with her child. As one does I go to greet the child and point blank I was told “stay away from my child.” We were in the middle of someone's living room, and I'm not like that, but the assumption was made all the same. I don't tell you to cause you to feel sorry for me. I knew what I was getting into when I went to seminary, but I didn't expect all these revelations to start happening like this again. But here we are, here we are my sisters and brothers, we as children, as adopted children of Jesus Christ, we go to our mother. 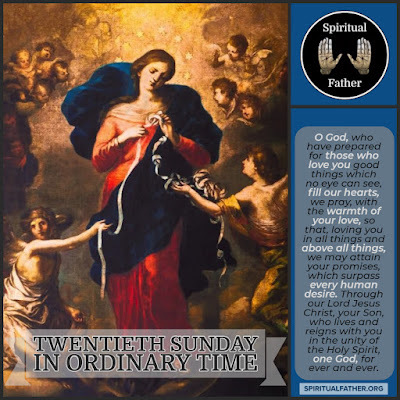 If you like, I have a prayer card asking the intercession of Our Lady Undoer of Knots - our Holy Father's favorite Marian apparition – Marian devotion. Our Holy Father’s words in response to this these recent revelations: sorrow and disgust, sorrow and disgust. He says, “I am on the side of the victims” and so should we all be. 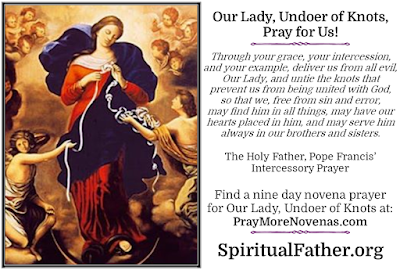 Our Holy Father, Pope Francis, he asks us to pray for the intercession of Our Lady Undoer of Knots. In this image of her she is just simply standing, untying knot, after knot, after knot. For those of us, for many of us I am certain, who feel tangled up inside, for those who don't know exactly what to do, I say let's ask for her intercession. Let's pray for her intercession. Let us ask her, to ask her Son to save His Church. I'll have these prayer cards in the back, after Mass if you would like to join me in praying this devotion to our Lady Undoer of Knots. With that, sisters and brothers, we move forward, we pray, we fast, we give alms, and we ask Almighty God to have mercy on His bride the Church. By a show of hands, who are the cat people here? Raise your hands high and proud. Disgusting. OK, you can put your hands down. There's another homily for you, we'll get to you later. Now, where are the dog people? Just to clarify, are we talking real dogs, or dogs that are more like cats? It's not really a real dog if you have bend over to pet it. It really isn't a dog, it's more like a cat. The reason I bring this up is I just got a dog a couple of months ago, I don't know if I've really told you about her. 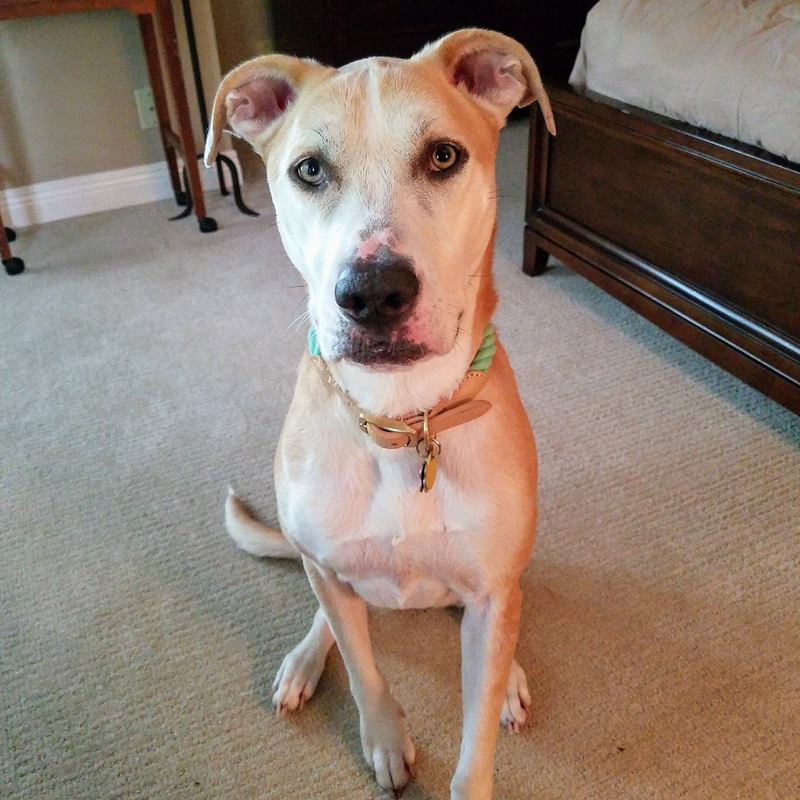 She's basically a real dog… you have to kind of bend - a little bit - to pet her, but her name is Lady, she's four and a half years old, she's kind of nuts. So, the rumor is true, there is a lady who lives in the rectory, and most of the time she sleeps in my bed. Last night, however, she slept in Father Jeff's bed because I was way, apparently, she’ll sleep with anybody! That's my dog! Dogs seem to always do things for food. Whatever it is you want them to do, have a treat ready. In so many ways dogs are guided by their stomachs. They live for food in so many ways. Another dog, actually a pair of Collies, that I often notice walking around the neighborhood, out taking their human for a walk. One of these Collies is always way out in front, and the other Collie is always way in the back, with their human right there in the middle. I imagined the Collie in the back is thinking “why are you taking us further and further away from food?” While the one in the front is thinking “if we walk faster we'll get back to the food sooner!” In this imaginary dialogue exists the tension between moving forward, and wanting to go back, and, in the end, this tension has to do with food. We can follow our stomachs just as much as a dog can. God desires to speak to us through our intellect, and through the emotions of our hearts, but oftentimes it is our stomachs that guide us. We see this with the Hebrew people wandering in the desert. They are grumbling to Moses and their leaders. They say, “why have you brought us out here to starve to death!? !” Not a bad question, but they are acting out of their hunger - their hunger is guiding them. Their need for food is what is informing their being, and so they complained and said “back in Egypt we had fleshpots (which is actually a synonym for sin - that's a whole other thing) and we had bread, we had fleshpots and bread back in Egypt, sure we were slaves, but at least we had food! Why have you brought us here, out into this wilderness, out into the desert?” They had some desire to go back, to return to the place where they knew they had food. 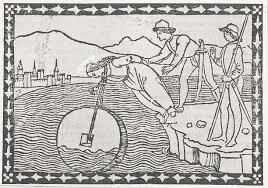 They had, as a people, crossed the Red Sea - the great symbol for baptism. They had gone through the waters of death and rebirth and come out the other side - they cannot go back - they are the chosen people of God. They are not supposed to go back, especially not if their stomachs are leading them. The lower desires of the human person pull individuals, and communities, back into slavery, it pulls them back to where they know they at least has food. Saint Paul picks up this theme in his letter to the Ephesians. Paul says, “do not return to acting as the gentiles do,” do not go back to acting as they do, he doesn't just say don't act like them, he says don't go back to acting like them - don't return to that way of life. We may at times fall, we may at times stumble, but do not just throw away what you have received. Do not forget the new identity in Christ that you have been called to, do not return to your Gentile ways. You can't go back! The entirety of humanity is lost in this desert, this desert between where we were, and where we are called to be, in between that land of slavery and looking forward to the land of promise. Just like the Hebrew people, lost in the desert wandering around this barren place, looking for glimmers of hope, longing for the promised homeland that God himself has sworn we will enter if we follow him. We make our way, with the help of God, through this desert. And yet sometimes we desire lowly things, earthly things, desires that tempt us back, back into our life before Christ, our life before baptism, our life ultimately without God. The Jewish people, in our Gospel for today, are also looking back and thinking about how they have received food and bread from Christ. Christ has multiplied the fish and the loaves, he has fed them, he has filled their stomachs, and they travel to the other shore because he can provide for them in that way. They are simply looking for him to give them the food that they need. They speak of how Moses provided them with food in the desert. What they fail to realize is that God’s covenant relationship with his people builds one on top of the other. 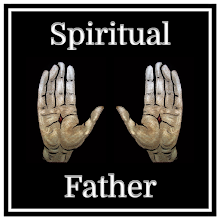 As they get closer, and closer, and closer to that great covenant, the Incarnation, when God becomes man, when God enters our reality as one of us, walks amongst us. God moves forward, God does not move backward. 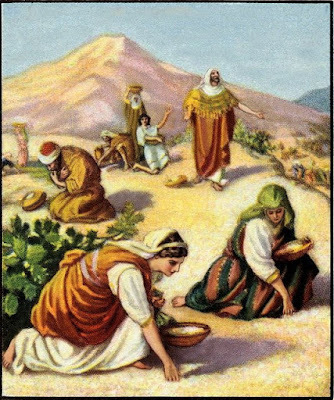 God has already provided physical food for the hungry - in the desert by providing manna for those who need sustenance, and in the previous scene, God has feed the hungry crowd by multiplying the fish and loaves. Does it not seem logical that God, having come in the flesh, God so much greater than Moses could even have imagined, would that God simply repeat what has been done before? Or would God choose to do something greater than Moses did? God, who has provided food to the hungry before the Incarnation, would the Incarnate God do something greater after the incarnation? God moves us forward, God does not call us backward. God provides for us still! They ask Jesus, “Lord give us this food always” and he answered that desire. Christ answered that desire then, and he answers it still today. 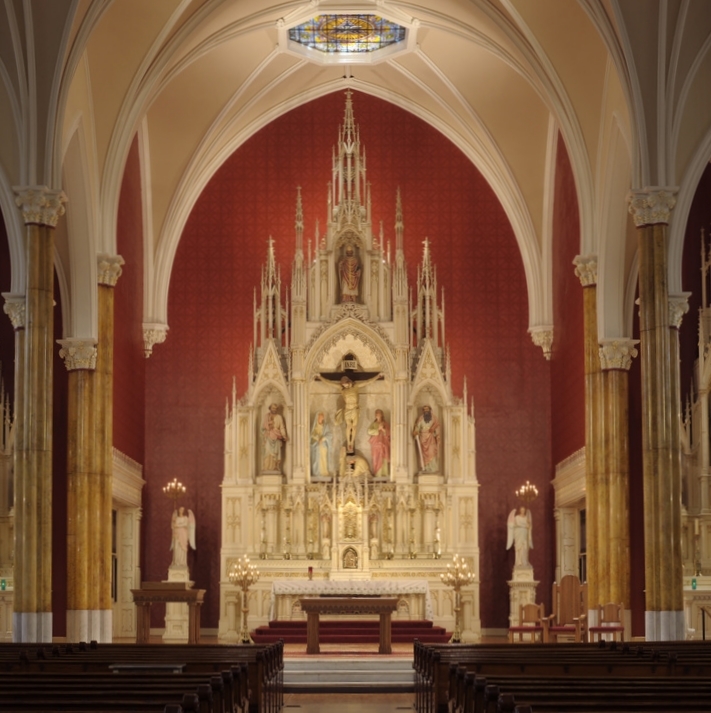 The food we receive from this altar may look, taste, and feel like ordinary food. It may have the outside appearance of ordinary fruit, but God is filling us with something so much greater than manna from heaven! The food of angels, we are told, was received by Moses and the Hebrews lost in the desert. We receive something so much greater. God moves us forward ,closer and closer to the kingdom of God. It is this food that will sustain us for that journey. 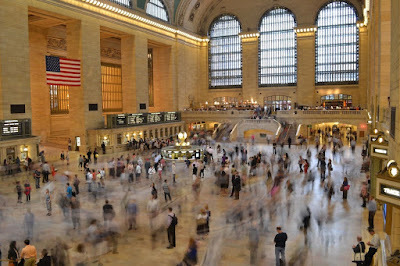 We returned here time and again, return to this sacred space, and sacred spaces like this across the world. Holy places where we catch a glimpse of paradise yet to come. Sunday after Sunday we return to receive this food to help us on this journey, to help us not fall back into slavery and sin, back to Egypt, but to move forward to the Promised Land where all of us, God willing, by our hope, prayer, and God's good grace, be together for eternity in that promised land, that we were promised so very long ago. 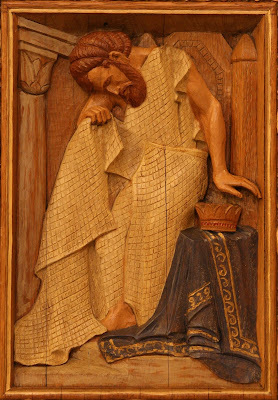 Pray for one another, as we receive from this altar, that our hearts, our minds, as well as our stomachs, be filled with this bread, this Eucharist, Christ himself offering himself to feed and sustain us.